There’s nothing like a walk-off hit to complete a doubleheader sweep. Gabe Matthews lined a single up the middle to score Max Foxcroft and Sam Novitske to give the Ducks an 8-7 win over Fresno State Saturday night. 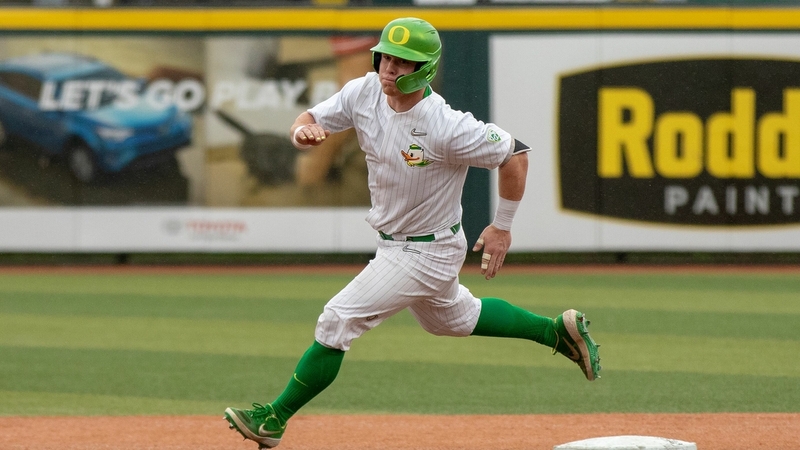 The win not only improved Oregon to 18-12 overall, it also preserved a series split with the Bulldogs mired with bad weather. Oregon began the day off in the right way with a 5-3 win in Game 1 of the twinbill. The Ducks needed that opening win in the worst way after losing the first two games of the series. Matthews managed to finish the nightcap 3-for-5 at the plate and four runs driven in. He drove in two runs in the first inning after Fresno State took an early 3-0 lead off of starting pitcher Brett Walker, who happened to settle down after that initial frame. Walker threw another three innings of shut out baseball before Cole Stringer relieved him to pitch another three frames. Stringer gave up two more runs and whiffed six. But the Ducks eventually found themselves down 7-6 heading into the bottom of the ninth. With one out, Foxcroft walked and Novitske singled. After a strikeout, the runners stole second and third. The Bulldogs intentionally walked Spencer Steer before Matthews sent everyone home with a single to center. It ended a 4-hour, 7-minute marathon game. It was even a longer day for the two teams and the fans that were at PK Park. 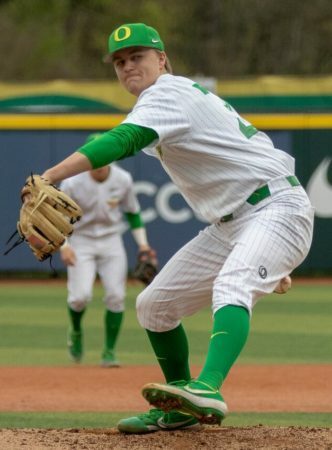 The announced attendance of 1,044 also sat through a three-hour affair earlier in the day that saw Oregon score two runs in the seventh to break a 3-3 tie and eventually win. Jonny DeLuca came up with the big hit and scored, again, Foxcroft and Novitske. Starting pitcher Cullen Kafta earned the win, pitching seven solid innings, giving up three runs and striking out seven. Ryne Nelson came out of the bullpen to pitch the remaining two frames and to earn his second save of the season. Saturday was a much better day for the Ducks because the previous two days were quite ugly. Fresno State came into Eugene and took a 14-2 win on Thursday and followed that win up with a 5-1 win on Friday. Despite those two losses, the Ducks have won five of their last seven as they head to Corvallis for a non-conference game with the Beavers. When the two teams played almost a month ago, Oregon played well enough to win, but OSU came away with the 7-6 victory. The Ducks will head up to Pullman this weekend for a three-game conference series with Washington State, a team that is struggling. The Cougars are 7-22 overall and 0-8 in Pac-12 action.